Five days into the ‘official’ 2013 Atlantic hurricane season Mother Nature has decided to comply by generating the first tropical cyclone, a named storm, of the still very young season. 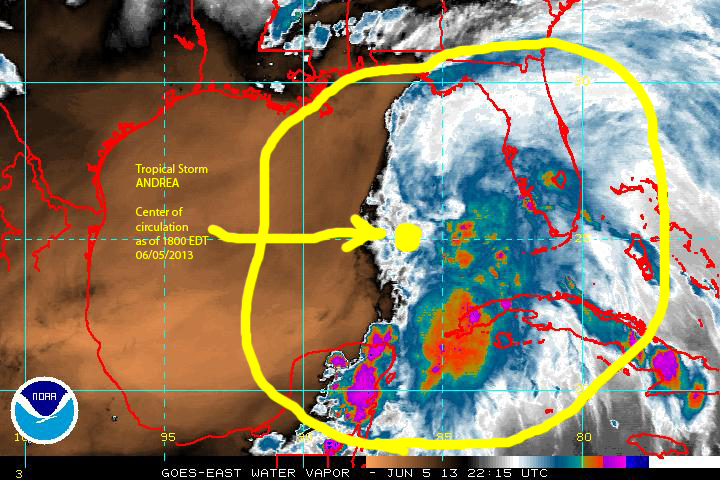 Tropical storm ANDREA generated from a tropical wave that had meandered over the north central Caribbean and then the southern gulf of Mexico over the past 3 -4 days. Tropical storm ANDREA, the first named tropical cyclone of the 2013 Atlantic Hurricane season was located near 25.3 N 86.5W in the Gulf of Mexico at 1800 EDT on June 5, 2013. The storm was tracking northward at a slow 3 mph. Tropical storm Andrea is expected to continue moving toward the north and then north by northeast toward a possible landfall in the Bind Bend area of Florida’s Gulf coast. The system is forecast to traverse the peninsula and then emerge over the southeastern USA coastal region. The most damaging components from Andrea are expected to be storm surge and wave action along Florida’s Gulf coast, extreme rain, and potentially some tornadoes. The wind analysis image below illustrate the steering currents that will help drive tropical storm Andrea on its projected track. Wind analysis showing steering winds and other atmospheric features interacting with tropical storm Andrea on June 5, 2013 as of 1700 EDT. Earlier this year, a couple of months ago, forecasters at Colorado State University, NOAA and the Weather Channel, issued their advanced forecasts for the 2013 Atlantic hurricane season. Colorado State called for 18 named storms including 9 hurricanes, of which 4 will be major hurricanes (category 3 or higher in the Saffir-Simpson scale), the Weather Channel is calling for 16 named storms including 9 hurricanes, of which 5 will be category 3 or higher. NOAA, in typical scientific fashion, issued a forecast based on ranges of storms rather than an exact number, calling for 13 to 20 named storms to include from 7 to 11 hurricanes, of which 3 to 6 will be major hurricanes. In addition NOAA gives its forecast a 70% likelihood that it will happen. While NOAA, Colorado State University and the Weather Channel play their numbers game pretty much in agreement in terms of overall numbers, the bottom line is that the 2013 Atlantic Hurricane Season is forecast to be more active than the average season, which over the past 63 years (1950m – 2012) has averaged 12 named storms, including 7 hurricanes, 3 of them major hurricanes, annually. Ominous and scary as these numbers appear, and that is all they are: just numbers, there is no need for anyone losing sleep over these forecasts. What really should get our undivided attention is that in only takes one hit to cause a lot of pain, human suffering, structural damage and economic loss. The extensive media coverage of what New Jersey and New York, and other neighboring states, are going through as a result of Hurricane Sandy is evidence enough of how true this axiom really is. In this regard, I submit that NOAA, the Weather Channel and Colorado State University, would provide a vastly superior public service by striving to communicate how damaging wind and storm surge generated by a hurricane can really be, and by finding ways to characterize the impacts of these damaging components of hurricanes on given communities, rather than playing the annual numbers game that is really meaningless to an individual residing in a hurricane vulnerable community. After all, what really makes a difference is not how many named storms or major hurricanes may actually happen in a given year, but whether that individual is prepared or not in terms of how protected his house is and how effective his emergency plan really is. In this regard I believe it is a good thing that Tropical Storm Andrea is happening so early into the 2013 Atlantic hurricane season, if only because it might shake some individuals out of complacency and into mitigation actions. Along these lines, the fact that the Eastern Pacific 2013 Hurricane season that officially started on May 15 has already generated two named storms, tropical storm ALVIN which generated right on cue on May 15 off the Pacific coast of Mexico and hurricane Barbara, which also generated off the coast of Mexico making landfall in southern Mexico to then traverse the isthmus of Tehuantepec as it degraded, to eventually emerge as a depression over the Bay of Campeche in the southwestern Gulf of Mexico. We will all have to wait and see how accurate the forecast numbers may be, but in the mean time we will all do well to pay attention to the tropics, to be prepared, and above all to seriously and actively engage in the practice of mitigation. Hurricane mitigation consists of all those practices and actions that will effectively reduce the potential for damage to our homes and communities from the impacts of future hurricanes.